Welcome to Episode 4! This week’s conversation is with Randy Lanthripe. 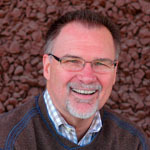 Randy is the Founder and Senior Pastor of Church in the Valley, in Diamond Bar, CA. and has been in vocational ministry for over 28 years.